The Culture of Experience – Let's Go Be Great! The culture of customer experience is upon us… although very nascent, while there have been a few companies grounded in customer service over the last 20 years they are outliers and not the norm. Most large companies are organized to serve themselves while providing a service or product to the market. Typically, one part of the organization is dedicated to the customer in the context of sales or marketing. 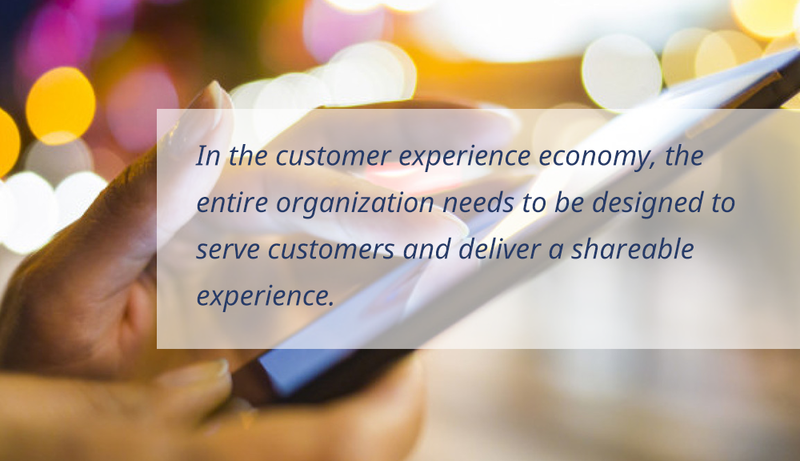 In the customer experience economy, the entire organization needs to be designed to serve customers and deliver a shareable experience. It must be understood throughout the organization the real value of a consumer spending their money and time interacting with a brand. I used to say that all companies are becoming publishers whether they wanted to or not, because the competition and the way that all purchasing has become considered sales cycle was going to force the issue. However, I think that we are now seeing with the proliferation of connections between people and the speed of communication through technology that all companies are now experience providers. For many years the experience, the interaction, was managed by a division within a Fortune 500 company who looked at the in store or in branch or in restaurant experience and created something that was visually appealing, memorable, pleasant and efficient. The design, well executed, helped consumers know where to stand in line, where to get help or look for specific products. It was staffed with friendly people who could naturally fill in the missing details or connections but most importantly provide a personalized experience or build a personal rapport with the consumer. They made the intuitively inefficient and efficient experience; if the design wasn’t quite right the personal connection filled the gaps. As technology has replaced many of these branches, stores and human touch points, in part because it’s more cost effective, in part because the speed of the transaction or the convenience for the consumer held sway. Large companies have inarticulately made an effort to increase the number of touch points or tackle the gaps in service as a series of technology and marketing projects. As with all transformations, a serialized and interstitial set of projects never provide the harmony and richness of the experience a consumer demands. Often times when I hear large companies speak about their digital transformation or customer experience projects they feel like how a symphony would be written by series of committees each focused on the instrument they play. It is the whole experience, in all its dimensions that need to be addressed. For a large company this is an almost achievable amount of organizational alignment required in a short period of time. Most companies have been built over decades and the organizational division, operating principals and culture cannot be rewired overnight. As with most disruption triggered by technology, the initial innovation is obtuse but with great promise. So while the value is well understood, the adoption model follows standard distribution curve, the early adopters take a leap of faith and when the point of leverage to value is understood the majority steps in. In some cases, the adoption curve can be accelerated when “killer” applications can be applied. In the case of digital transformation, the killer application is personalization. Delivering experience in context, that is relevant and personalized is the key to moving an organization forward. In the case of customer experience and within the experience economy, the accelerant is the ability of large organization to deliver personalized or in contextualized experiences. While it may take a decade or more for a Fortune 500 company to reorganize, we can deliver value today through a more personalized experience. As expected the organizational changes that will take time to work their way through a company that spent decades building for and organizing around 20th century models can recognize immediate value by through technology recreating the front line staff that helped clients find what they needed, answered questions and most importantly build a sense of intimacy between a consumer and brand.